Detroit visual artist, Nic Notion made Playground Detroit his canvas earlier this year, highlighted as the first ever artist to solo exhibit from the gallery’s space. 8 months later, the gritty creative has decided to take ownership of his artistic trajectory, introducing his Good Amerixan exhibit. 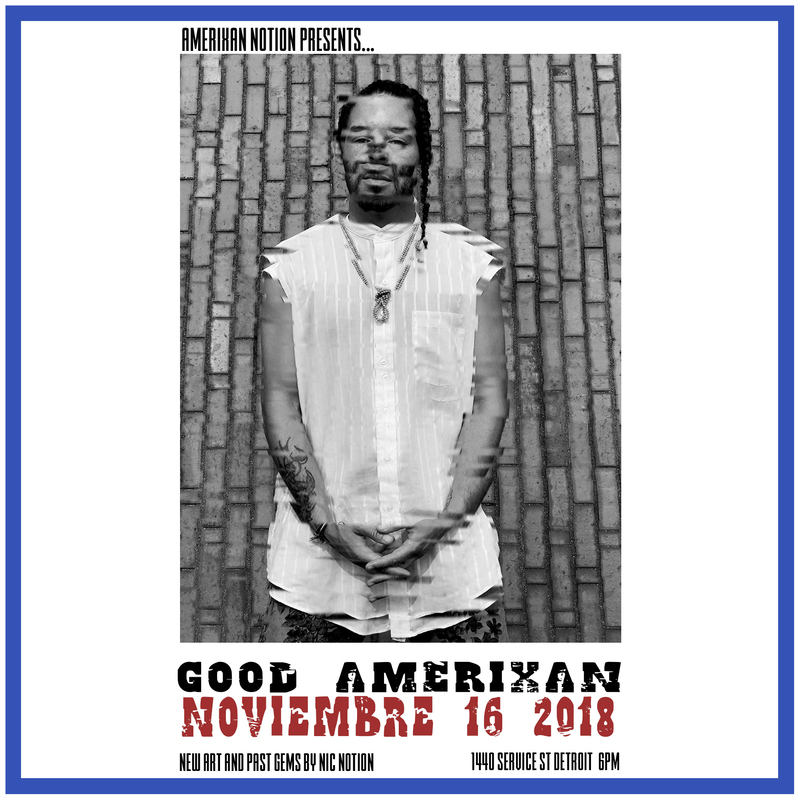 The show will take place at his tenancy this Friday, 11/16/18, at located in Eastern Market on 1140 Service Street, Detroit, MI 48207. 6:00 pm EST. The notion of what Detroit culture truly represents, can be a blurred based on the perspective lens of the viewer. Amidst the huge culture shift and Gentrification accession Detroit has recently undertaken, Nic Notion has created a visual series that exemplifies the framework of what space, time and freedom represent for true “Detroiters” and “Good Amerixans“. Please see below for Nic Notion’s BIO + ARTIST STATEMENT. Nic Notion (American, b. 1983) is a visual artist who lives and works in Detroit, Michigan. His studies in Broadcast Communication at Wayne State University and videography work in Detroit’s early 2000s hip hop scene have refined his keen eye and sense of composition. Driven by his deep love for the people and environment of Detroit, Notion approaches this eclectic and energetic urban canvas from a pedestrian perspective, capturing moments and details so very often missed in our fast paced daily lives. These details, containing themes of optimism, community, and decay, are expressed in his abstract paintings, for which he is especially known. Notion’s pioneering style blends elements of street and fine art, creating his signature contrast between luxury and wreckage. His non-traditional methods include the usage of putty knives and industrial paint to develop dynamic layers and aggressive lines on canvas. Drawing artistic muse from his interactions with street performers, panhandlers, criminals, the youth, and elders of Detroit, Nic Notion canvasses the city for the beauty within a collective chaos. Nic Notion has shown his work in Detroit, Chicago, New York, San Francisco, and London UK. My art resides in the contradiction between grit and beauty found in the streets of my hometown, Detroit; a city of extremes and vital American history. I am aesthetically inspired by the city’s architecture, indigenous people, and abandoned elements. My life in the city, and everyday interactions with the people of Detroit from all walks of life, has given breath to my work. My methods include using putty knives and layers of paint to create distinct textures which exposes the tension and contrast within my ever-changing environment. Canvases and found objects such as drawers and plywood are the basis from which I transform discarded materials into my perfection. My art removes and redefines these items from their original context, inspiring viewers to perceive their own environments at their core.